Belfast based innovation and design studio Big Motive has designed the user experience for the BBC Pandemic Mobile app. The app, which launches today is a life-saving tool that will be used to measure the spread of a digital “pathogen” as it infects people across the UK. The app will ask volunteers a series of questions about their social interactions and will ask permission to use GPS data to map movement (to the nearest km²) for a 24 hour period. No identifiable personal information will be taken by the app. Participation in the study is entirely anonymous. 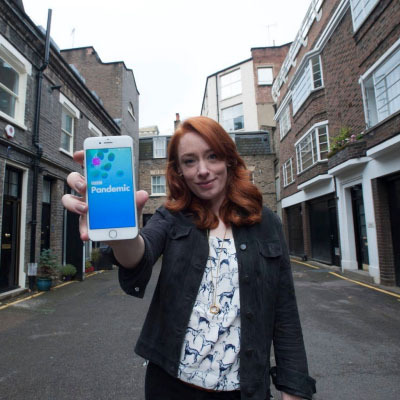 In a first of its kind nationwide citizen science experiment, Dr Hannah Fry is asking volunteers to download the BBC Pandemic App onto their smartphones. The free app will anonymously collect vital data on how far users travel over a 24 hour period. This data will be used to simulate the spread of a highly infectious disease to see what might happen when – not if – a real pandemic hits the UK. By partnering with researchers at the University of Cambridge and the London School of Hygiene and Tropical Medicine, the BBC Pandemic app will identify the human networks and behaviours that spread infectious disease. The data collated from the app will help improve public health planning and outbreak control. The results of the experiment will be revealed in a 90 minute landmark documentary, BBC Pandemic which will air in spring 2018 on BBC Four with Dr Hannah Fry and Dr Javid Abdelmoneim. The pair will chart the creation of the first ever life-saving pandemic, provide new insight into the latest pandemic science and use the data collected by the BBC Pandemic app to chart how an outbreak would spread across the UK. In the last 100 years there have been four major flu pandemics including the Spanish Influenza outbreak of 1918 that killed up to 100 million people worldwide. The Government National Risk Register estimates that infectious diseases are an even greater risk since 2015 and pandemic flu is the key concern as 50% of the population could be affected. “Nobody knows when the next epidemic will hit, how far it will spread, or how many people will be affected. And yet, because of the power of mathematics, we can still be prepared for whatever lies ahead. What’s really important is that every single download will help improve our models so please please do take part – it will make a difference.” explains Dr Fry. Dr Abdelmoneim says: “We shouldn’t underestimate the flu virus. It could easily be the cause of a major pandemic that could sweep around the world in a matter of weeks. I’m really excited about the BBC Pandemic app. If it can help predict the spread of a disease and be used to work out ways to slow that spread, it will be much easier for society and our healthcare system to manage”. “Creating an app to collect data that can be used to make a life saving tool is a genuinely ground breaking and exciting commission for BBC Four” says Diene Peterle, Specialist Factual Commissioner, BBC. BBC Pandemic was commissioned by Cassian Harrison Editor, BBC Four and Diene Peterle, Specialist Factual Commissioner and will be produced by 360 Production.